I have posted a couple of times now of our many trips to Singapore, including the Gardens by the Bay and Marina Bay Sands art and decoration. These posts were predominantly about man made structures. 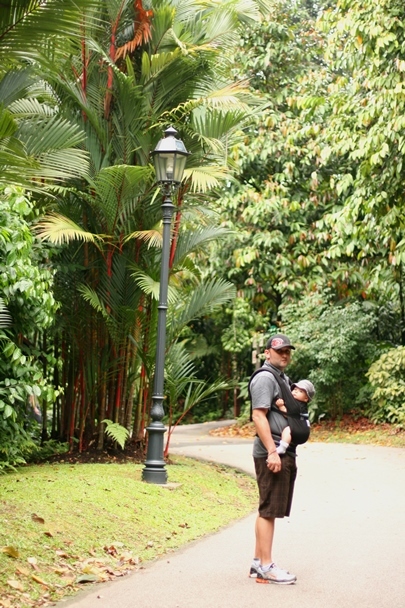 Singapore is known worldwide as the Garden City, but for some reason it was not until my sixth trip to the country that I managed to visit the Singapore Botanic Gardens. The gardens also contain the National Orchid Garden and it is a surreal escape from the hustle and bustle of the city state’s downtown area. Given Singapore’s tropic location, it is always raining there. But the rain didn’t deter us from visiting the gardens, and it added a different dynamic to the surroundings. I really enjoyed the few hours we spent there, it was relaxing, even though we walked a lot! I was surprised at being allowed to get so close to some of the flowers and plants to shoot macro. There are also some garden sculptures throughout the gardens, but it is not over the top and compliments the gardens well. Even on a cloudy, rainy day the gardens are alive with colour. Below are my favourite photos from our trip, and as usual the images link through to my larger photos on Flickr. I spent a good portion of my visit carrying the Pok in his “rucksack” while he was asleep. It is quite strange trying to operate a Digital SLR camera with a big weight hanging from your belly. It is quite easy to get to the gardens with a bus stop right next to the Southern end of the park and a metro station at the Northern end. There are also quite a few exhibitions on as well during the year. Timing your visit, if that is possible, to be around the time of the orchid blooms makes for a much better visit. If you want to know where the Botanic Gardens are, I have attached a link to the location on Google Maps below.